Deadline for submission of ad copy is the 10th of the month preceding the month of publication. Graphic assistance available at no charge. Please support our advertisers: We welcome commercial ads in Der Auspuff. They help support our club, and we encourage you to make your first call to those who help us enjoy our great hobby. Let them know you saw their ad in Der Auspuff. We also encourage you to promote your own business by becoming an advertiser yourself. For information, please contact: Bob Clarke. (805) 200-6596 bobshighwaygarage@gmail.com Der Auspuff, which translates as “the exhaust,” is the official publication of the Santa Barbara Region, Porsche Club of America. Chartered regions of PCA are granted permission to reprint any material herein provided full credit is given to the author and Der Auspuff (with the exception of copyrighted material). 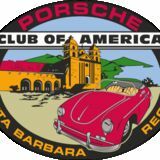 Any statement appearing in Der Auspuff is that of the author, and does not constitute an opinion of the Porsche Club of America, the Santa Barbara Region, its Board or Appointees, the Der Auspuff Editors, or its Staff. The Editorial Staff reserves the right to edit all material submitted for publication. Deadline for submittal of material to be considered for Der Auspuff is the 10th of the month preceding the month of publication. know how much each of you look forward to receiving der Auspuff in the mail and flipping through the pages to look for photos of yourself and your cars and to read about club events. It takes a lot of time and effort (approximately 20 hours per month) to put together each issue and many regions have stopped their print newsletters because they could not find volunteers to edit them. Santa Barbara Region is very fortunate that, after an unsuccessful 6-month long search to find replacements for Mike Kurreck and Carl Bell, Nick Liakas has volunteered to become the Editor of der Auspuff. This is his first issue. A big Thank You from all of us to Nick! nominations for SBR Charity of the Year? If you have a charity to which you contribute your time and/or money and would like to nominate it, please email the name of the charity and why you think it should be selected to me by March 31st. Note: charities must be rated “good” or “exceptional” by CharityNavigator.com. The board will select the SBR Charity of the Year at its May board meeting. On a sad note I recently learned that Jim Hall Racing Club will be going out of business soon because Haas Automation has not renewed their lease. Our autocross course will become their new warehouse in 2019. Jim is a Santa Barbara Region member and graciously allowed us to use his track last year and for two events so far this year. Our search for a new autocross venue continues. If you work at a company with a large, clear parking lot and have some influence please contact Glenn Crawford to discuss whether we may be able to use it for as our next autocross venue. In a month we will be hosting Treffen Santa Barbara. This PCA national event sold out within 2-1/2 hours! The Region’s preparations are now complete and we look forward to welcoming about 250 PCAers and 150 cars from around the US to our beautiful corner of the World from April 3rd – 6th. Thank you to all of you who volunteered to help with Registration, Information, the Drives, and more. Drive safely! If you can’t stand the heat, get out of the kitchen – Harry Truman Here’s another fine mess you’ve gotten me into – Oliver Hardy. What, me worry? Alfred E. Newman Why am I doing this again – yours truly My management participation with the Porsche Club of America, Santa Barbara Region (PCA/SBR) started at the turn of this century as editor of Der Auspuff, a post I held for more than three years. I transitioned to region president, activities chair, co-founder of R.U.F., tour leader and several other responsibilities. I thought I was done but events and incidents beyond my control have brought me back – full circle. Our club is very active and nationally recognized for its superior member participation, being named Region of the Year and having the Family of the Year honors, plus numerous kudos for our magazine. Lately however we have lost some of our steam. Instead of a monthly and eagerly awaited full color magazine, we published only four issues this past year. For 2019, no one stepped up to act as editor, and our board of directors had to make painful decisions. It seemed as if we were facing the loss of our main source of communication with our members – the printed magazine – to that irritating and heartless inter-net. That would not stand! (George H.W. Bush.) So, you are once again stuck with me. SBR will publish six issues of Der Auspuff in 2019 – for every odd numbered month. To assist in this endeavor, we have recruited a number of accomplished photographers, masters of the English language, graphic artists and proofreaders – and as important – writers and reporters. This first issue of 2019 probably has some holes and bumps, but all will be ironed out by the May issue. Here’s what you can do to help: have fun, take part, make friendships, come up with ideas for club activities, adopt a leadership role, and offer to help. Not too much to ask for, right? I am the editor once more of our beloved magazine. February Camarillo Breakfast was cancelled due to rain. 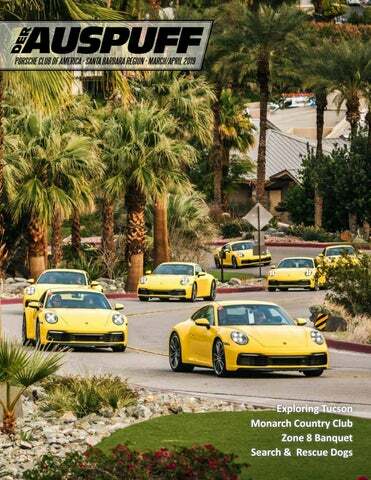 SPRINGTIME, BACK ROADS TO OJAI LUNCH AT BOCCALI’S Saturday, April 27, 2019 Join us for a springtime drive to Ojai where you’ll enjoy lunch with other Porsche enthusiasts. We’ll meet at 9:00 am at Premier Coach, 852 Via Alondra, Camarillo, for a light breakfast and a tour of their Porscheapproved collision repair shop. Shortly after 10:00 we’ll depart for Ojai with no freeway driving, just great back roads at a scenic time of the year. We’ll end the first leg of our drive at Boccali’s Pizza and Pasta, dining al fresco under the oaks. Recipes are “original Ojai Italian,” inspired by family favorites passed down from the Boccalis who settled in the region in 1898. Pizza, pasta, and a beverage are included in the entry fee. Alcoholic beverages and dessert are extra, which they ask you to pay for with cash. After lunch you may enjoy Ojai on your own or caravan back with friends. Cost is $35 per person, which includes lunch and the activity fee. Please make checks payable to PCA/SBR. No refunds after April 20. For questions, please contact Steve Geldman at imagerep@gmail.com or (805) 279-0466. To start the year off right, our Santa Barbara Region traveled on January 25 to Tucson, Arizona for a fabulous fourday weekend hosted and planned by Jim and Barbara Spencer. We were joined by Porsche club members from Zone 8 and that made the trip even more memorable because we made wonderful new friends. We started the weekend arriving at the beautiful Marriott Starr Pass Resort and Spa nestled in the Tucson mountains. The weather was picture perfect. On Saturday morning we went to the Arizona Sonora Desert Museum which is a worldrenowned zoo, natural history museum and botanical gardens all in one location. Porsches do attract attention! As we started our morning trip, a guest at the hotel asked if he could video our parade of Porsches, therefor our departure for the day’s activities was filmed for our memories. On Saturday afternoon we were off to Old Tucson where many classic and current western movies have been filmed. The spirit of the ”wild west” came alive here with stunt shows, gun fights, and can-can shows. It was fun to reminisce about all the classic western TV shows and movies. We heard stories about when legendary actors like John Wayne, Jimmy Stewart, Kirk Douglas and Maureen O’Hara filmed there from the 1950’s to 1970’s. On Sunday we drove to the Pima Air and Space Museum which is one of the largest aviation museums in the world with over 350 historical aircraft. A beautiful drive up the winding roads to Mount Lemmon with an elevation of 10,000 feet and beautiful rock formations completed the day. On Monday we traveled to Tombstone, known for its wild west history, gun fights , and the Boot Hill cemetery. Some of our group ventured off to the spectacular Colossal Caves and the Saguaro National Park. In reflecting back on this trip, one of the best parts was meeting our new Porsche club friends from San Diego, Nevada, Tucson, and Paso Robles. It makes you realize how wonderful people are and how Porsches can bridge new friendships. In fact, we will meet many of these people again as they come to the Treffen in Santa Barbara this April. EXPLORE UNIQUE CALIFORNIA HIST HISTORY HIS TOR RY Y AT AT THE HOME OF THE “BAKERSFIELD “BAKERSFIELD SOUND,” SOUN SOUND THE COUNTRY WESTERN MUSIC MADE FAMOUS BY BUCK OWENS & MERLE HAGGARD. Join your fellow SBR members on an exploration of a unique California historic site! Our destination on Saturday, March 23, via exciting and scenic back roads, will be THE BUCK OWENS’ CRYSTAL PALACE in Bakersfield, a shrine to the brand of country music made famous by Mr. Owens and his band, The Buckaroos. We will enjoy a fabulous show and multi-course dinner at The Palace after touring the museum dedicated to country western music and artists. After dinner and the show, the band will provide magnificent country music for our members to dance to. You may stay and enjoy the dancing as long as you’d like. Sunday, our members are on their own to experience some of the activities available in the Bakersfield area, such as a beautiful drive to Lake Isabella or a unique Basque lunch at Noriega’s, now recognized as the oldest, and last, Basque boardinghouse and restaurant in the world. The Noriega Hotel continues to be the hub of the Kern County Basque community and is proud to serve exceptional Basque “family style” meals to the public. Or, stop at Outlets at Tejon Ranch located in Grapevine or some of the other attractions in the area. The overnight adventure includes lunch Saturday, the tour of the Buck Owens’ museum, dinner and show at The Crystal Palace, Sunday buffet breakfast, and SBR activity fee, all for only $115 per person! You must book your own hotel room individually by calling the Hilton DoubleTree Hotel (888-779-4694) by March 1, 2019, in order to get our special group rate of $120 plus tax. Please mention the PCA/SBR group when reserving your room. There are only 25 rooms reserved at the special low rate. The last time we enjoyed this event it was an early sellout and very successful with many accolades. If you are interested, please send in the form as early as possible. Your reservation form and check must be received no later than March 15, 2019. No refunds after March 15. CONVOY TO COUNTRY WESTERN COUNTRY Please complete and mail this form with your check payable to PCA/SBR to Howard Rubenstein, PO Box 4855, Thousand Oaks, CA 91359 no later than March 15, 2019. No refunds after March 15. Vittles Saturday Lunch at the hotel A mix of turkey and ham sandwiches on wheat or white bread, garden salad with ranch or Italian dressing, bags of chips, Doubletree chocolate chip cookie, and ice tea and water. Saturday Dinner Dinner selection will be Dorothy’s Favorite Filet Mignon cooked medium and Cedar Plank Grilled Salmon, and includes green salad with roasted garlic balsamic dressing, homemade biscuits, mashed potatoes with homemade country sausage gravy, and fresh-cooked green beans seasoned in sauteed bacon and onions. Included is refillable sodas, iced tea and freshly brewed coffee along with chocolate cake for dessert. Sunday Breakfast Buffet breakfast at the Doubletree. PCASBR Supports the Search Dog Foundation Provided By Rem Laan search dogs with new owners who work for search and rescue task forces across the country. Dog and owner then learn how to work together for two weeks at the SDF before graduating. The SDF follows their graduates throughout their careers and provides on-going training and care as necessary. SDF trained dogs and their owners have participated in search and rescue operations around the World including the World Trade Center bombing and the earthquake in Haiti. Thirteen SDF trained teams helped with the search and rescue operations after the Montecito mud slides. Mark, Lynne, my wife Sally and I were very impressed with the SDF and are confident the Clubâ&#x20AC;&#x2122;s donation will be put to good use. In March 2018 the SBR Board selected the National Search Dog Foundation (SDF) in Santa Paula as our Charity of the Year. The SDF was nominated by SBR members Mark and Lynne Krueger. Fast forward 10 months and it was my pleasure to present SDF Executive Director, George Haynes, with a check for $3,500. What a turnout! Seventy-seven SBR members in 40 gleaming Porsches gathered on February 23 at the Porsche Santa Barbara dealership for a beautiful and moderately challenging drive to the Monarch Trilogy Country Club in Nipomo. The recent rains paused and the sky returned to is glorious blue, and the rainbow of Porsches felt at home. Along the way, numerous photo opportunities arose, and at many sites one could see our club photographer, Steve Geldman, positioned to click the shutter capturing vivid scenes of our adventure. No one knows how he managed to precede us to his favorite locations always in advance of the main party! We know, but won’t tell! Our route took us through Buellton, Lompoc and Los Alamos via numerous turns and hills that highlighted the green landscape that benefited from recent rains. We were lucky – the roads were open and did not present any problems for our trek through the back-country. The caravan was long enough that at many curvy locations one could see the front and rear of the procession, a view reminiscent of a train ride coming around the bend. The Monarch C.C. staff had reserved a large section of its parking lot for our group. The mass gathering of Porsches with the clubhouse in the background was not only a perfect setting, it was also a timely destination for a rest stop after more than two hours of Porsche lifestyle driving! It was time to take a break. There was a magnificent buffet waiting in the main catering hall at the club. Tables for eight filled the room and its picture windows let in plenty of light add to the glow of the day. It was rewarding to see many newer members mingling with the veterans and getting tips and advice for future SBR events. This is how life-long friendships begin. Stomachs full, rest stop completed, conversations coming to an end – time to return home. A perfect day with wonderful friends came to an end. More of the same at our next adventure, the overnight trip to Bakersfield for country music and dancing! instructors. Shortly thereafter, Jeff Crute (pit Manager) safely passed them off to Gary Olmstead who flagged the student drivers on and off the track. Every 45 minutes, the two groups alternated from classroom to track. The students were fortunate enough to be able to run an unexpectedly large number of laps, and just before lunch, I was getting warnings that if we kept this much driving up that the students would wear out or they’d run out of gas! We took a break and I surveyed what I suspected was a few of the thirstiest cars to check their fuel levels and they were just fine. No students were worn out and no vehicles ran out of gas during this event! We stopped for a half-hour lunch to give everyone a break, and then back out we went for one more practice session for each class. During the last session we simulated an actual autocross format by timing each of the students last three individual laps. Even though everyone put in respectable times, I was asked by a couple of students to please not publish their timed results. However, everyone learned and improved a lot. Our volunteer instructors are absolutely fantastic! I cannot thank them (Jim, Mike, Don, Ted, Art, Ian, John, Quynh, Kathy, Bill, Warren and David) enough for their patient in-car guidance of the students. Each instructor endured 100 laps in student vehicles. Of course, most of the cars were Porsches, so how bad could it be? The students though tired, wore big smiles at the end of the day and left the track as more skilled and educated drivers. I hope to see all of you out on a track soon. AUTOCROSS DANCING IN THE RAIN Story by: Glenn Crawford Photos by: Steve Geldman Santa Barbara Region hosted the first multi-region Zone 8 Autocross of 2019 at Jim Hall Racing in Oxnard. It was advertised as a rain-or-shine event, but how many times have we seen and laughed at that? Well, this time we got it all! Starting at 8am, the drivers and volunteers proceeded through registration with Sue Kinsling, our region’s membership chair. Then, our cars were expertly teched by Henry Hinck from Schneider Autohaus under cool but beautiful blue skies! We all tried to deny what our phones weather apps were forecasting. The group Track Walk was safety oriented and went great, then practices began and that’s when it happened. First, little drops and then it started to rain for real! Guess what happened? It was full-on dancing in the rain! I was so proud to see my fellow PCA members and friends frolicking on slick pavement in the rain! It was a great experience enjoyed by everyone. The rain eventually left us before our delicious BBQ lunch arrived. After lunch, the skies stayed dry but things got a lot more serious. Participants started to push their machines. Most runs were clean, but there were a few minor spins and a few agricultural adventures (by people who will not be named). Participants started to really pay attention to each other’s lines, techniques and of course, times. The one draw-back of the day was our timing display board. It did not want to talk to Warren White’s timing system. People had their friends doing timing reconnaissance on their phones. Practice ended around 2 p.m. with most getting close to 30 runs before timed runs officially began. You could hear, feel and see the difference. At the end of timed runs we posted results. What a surprise! Jim Hall in his white GT3) was unofficially the fastest time of day. Don Dickey, who had been teased driving the 2016 Cayenne GTS (instead of the Turbo S - due to a cut tire late Friday) wasn’t last but finished midfield! We all said our goodbyes and happily drove off our own ways before sunset under blue skies and a stout Oxnard breeze. classic Santa Barbara Region event: the 75-mile drive on some legendary bends, loops, and curls, perfect for Porsches, followed by a flavorful lunch at BJ’s Restaurant & Brewhouse in Valencia. We’ll start in Moorpark and head to Fillmore over Grimes Canyon Road, the former path of the old stagecoach route in the Santa Susanna Mountains. From there it will be eastward on CA-126 to San Francisquito Canyon Road, part of the original route of “El Camino Viejo,” the historic road from Stockton to Los Angeles in the late 1800s. Next comes Spunky Canyon and Green Valley (cue the “Dueling Banjos”). The final leg to Valencia is Bouquet Canyon Road, a stretch steeped in California ranching history and named from the stories of “El Buque” (Spanish for “the ship”) by a French sailor turned settler and vaquero. Lunch in Valencia will feature garden salad, deep-dish pizza, and a nonalcoholic beverage of your choice. We’ll check in at 9:00 a.m. in Moorpark at the Target parking lot, 832 New Los Angeles Avenue, just west of CA-23. Departure time is 9:30 a.m. sharp. Event cost is $30 per person, which includes lunch and activity fee. RSVP now to Doreen Pankow, dpankow@sbcglobal.net or 805-422-8217, and then send your check with the form below. he Santa Barbara Region of the Porsche Club of America invites its members to a shared remembrance of our fallen military heroes, Sunday, May 26, 2019. Bring your own picnic lunch for a gathering in Los Alamos County Park following a beautiful drive. We suggest you wear or bring RED, WHITE, OR BLUE clothing, table cloths, napkins, and other patriotic decorations. We’ll start our day at 9:00 a.m. at the Sears parking lot on South La Cumbre Road, Santa Barbara, and depart by 9:30. A driving tour of the Lompoc Flower Trail will follow through the “Valley of Arts and Flowers” where we expect to see spectacular patches of spring colors in the farm fields of the valley. Stock, Larkspur, Dephinium, Sweet Pea Bells of Ireland along with other varieties are grown in abundance by commercial flower growers. And from there we’ll continue our drive on back roads to Drum Canyon Road and Los Alamos County Park where we have reserved a picnic area at this site. To register for this event, please complete the form below and mail it to Doreen Pankow no later than May 20. Please include a check payable to PCA/SBR in the amount of $10 per person. Note that this fee is waived for military veterans and family members riding with them. TAILORED TO EXCITE. VISIT US TODAY! December 8 SBR Holiday Brunch at La Cumbre C.C. The American Dream ComesTrue for Dr.h.c Paul Rusnak It’s all true. As a 14 year old from Soviet invasion and occupation of his homeland arrives to America, completes his education, goes on to open his first new car dealership in Culver City in 1959 – and then races up the ladder of success to international fame and glory. So it started. Paul Rusnak, patriarch of the family that now owns 16 new car dealerships in Southern California, proves that the dream is there and doing well. There’s more, however, that more clearly defines this man. Mr. Rusnak never forgot his European origins. As soon as he was settled in America, he began his life-long odyssey of supporting Czechoslovakia’s freedom from Russian oppression. His moral beliefs and financial abilities played a key role in the final decade of the 20th century when the dream of all patriots was realized. That freedom did not end his quest - he helped and guided the peaceful effort by Slovakians to secure their own republic, thus forming the Slovak Republic (and as a consequence, Czech Republic). Ask anyone in Slovakia who Paul Rusnak is, and you will see instant recognition and admiration. For a time, many citizens of the republic believed that he was the country’s president. In fact, there was an incident when he was stopped for speeding, and the officer that pulled him over took one look at the driver and immediately apologized for the stop - stating “I am sorry Mr. President; I did not realize it was you.” A man of honor, a philanthropist, a patriot. T U O D L O S THANK YOU! Miscellaneous Porsche Items K&N air filter for 996 series (‘99-’05) “Bra” & car cover for 356 series Clymer’s 1965-’82 Shop Manual Clymer’s Service Repair Handbook for 1965-’76 Elfrink’s Tech manual-356 ‘59A/’63B/’64C driver’s manuals ‘Workshop Manual’ 356B 1600 & 1600S “009” distributor for the 356 series For pictures and individual prices contact Rich Jonsson (818) 324-3457 titleitrich@yahoo.com 997 Car Cover Porsche fitted indoor/outdoor car cover for 997.2. Will likely also fit a 997.1. Very good condition. Asking $135.00. Rem Laan, 317-294-4884. WANTED: Carrera S Looking for a Carrera S 2010-2013 with Manual Transmission. Please contact Marty Blumenthal @ 818-207-6598 or email at dataform@att.net. ha! with my turbo i will win! sorry! by going fast you will miss the clues and lose! This is fun! Our drive will take us on some roads just perfect for Porsches. The rally will last somewhat over two hours of attentive driving and beautiful scenery. No racing here -- only careful powers of observation and clever thinking will put you in the winners’ circle. A bonding experience for you and your navigator. The top three teams as determined by the highest number of correct answers will be our prize winners. You will need a driver in a Porsche, a navigator (not a Lincoln), and a clipboard with pen or pencil. Water, sunglasses, and sunscreen will come in handy, too. Meeting time is 8:00 a.m. at Rusnak/Westlake Porsche, 3839 Auto Mall Drive, Thousand Oaks, where we’ll be offered complimentary coffee and pastries. The rally will end at Dos Vientos Center in Newbury Park. There we’ll be treated to a great barbecue lunch by Q-Time BBQ. The total cost is only $30 per person, including lunch, drinks, and SBR activity fee. These are always popular events. RSVP early by filling out the form below and submitting it with your check. SBR’s Gimmick Rally 2019 NAMES: ________________________________________ EMAIL: _________________________________________ PHONE #: ________________________________________ # OF PARTICIPANTS: ___ AMOUNT ENCLOSED: ________________ Send this form and your check payable to PCA/SBR by June 19, 2019, to: JERRY & PAM LASNIK, 25 MARIMAR STREET, THOUSAND OAKS, CA 91360 Sorry, no refunds or cancellations after June 15, 2019. Woolsey Fire Survivor! When Joan and I returned to our burned-out home along Mulholland Highway on Nov 10th, the first surprise was our Porsche sitting out in front of the burned-out garage. Someone had pushed it out; we still do not know who it was. Our 2002 Porsche 911 Turbo which was in the RV garage also survived. Otherwise, everything else was a disheartening mess.